The participants of the meetings discussed the priority issues of the institutional development of the international transport corridor “Europe-the Caucasus-Asia”. Within the meeting discussion touched the issues of the improvements of the IGC TRACECA structures, further strategic and integration prospects of the region for further implementation of the new Strategy of TRACECA – Master Plan. Mr. Beglaryan, Mr. Ciopraga and Mr. Grigoryan exchanged opinions on the upcoming Meeting of the PS IGC TRACECA, scheduled for 11 November 2015 and the main points of the Agenda. Parties underlined that further TRACECA Strategy is of great of importance at the moment. 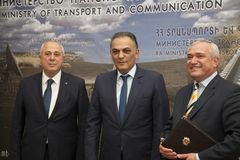 During the meeting Mr. Beglaryan signed a Technical Annex to the TRACECA Basic Agreement on Fundamental Principles of Railway-Ferry Terminal Operation on the Black and the Caspian Sea’’. This Annex creates opportunity to increase the volume of cargo transportation from Armenia to Europe by road and railway-ferry terminal via the Black Sea ports of Poti and Batumi. It will facilitate the process of freight transportation for transportation companies, bureaucracy will be reduced along with time and cost. Preferential terms will be set for transit transportation.